Hal-Liurz, an Argonian, is the personal steward to Count Janus Hassildor of Skingrad. She is the person you need to talk to in order to speak with the Count. Her job certainly takes precedence over her daily routine. She wakes up early in the morning at 6am and immediately heads to Castle Skingrad's County Hall, where she will roam around during fourteen long hours, attending anyone wishing to speak with the Count. After a long day of work she will head to the Dining Hall, where she will seek an available place to sit, to enjoy her only meal of the day for four hours. Once she has finished her dinner she will head to the Lord's Manor, where she will stroll around until 2am; at that time she will head to her room in the Living Quarters to sleep for a short period of four hours. Hal-Liurz wears a full set of common upper-class clothing, consisting of a green brocade doublet combined with a green silk garment and a pair of green velvet shoes. She also carries with her the castle key, the key that grants access to the Lord's Manor, and a leveled amount of gold. By being a humble steward she is a rather pacific person, but she won't hesitate to use her fists during combat to defend herself. 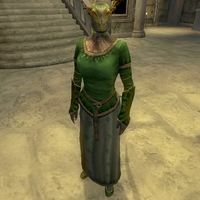 She will express her dedication to her job from the very first you meet her: "I'm Hal-Liurz, Count Skingrad's steward. The Count does not accept unsolicited visitors, I'm afraid. I apologize for the inconvenience." If you ask her about Skingrad, she will continue to talk about her role in the Castle: "Count Skingrad is a very private person. I handle all the county's public affairs, and consult with the Count when necessary." During the Ulterior Motives quest in the Mages Guild questline, she will inform you to speak to the other steward when seeking an audience with the Count: "I'm afraid that's not my arena. You'll have to speak to Mercator about seeing the Count." Following Mercator's death, Hal-Liurz becomes the head steward for the Count. During the Information at a Price quest, she will be expecting your arrival: "You are here to see the Count, yes? He has been expecting you. Please, wait here, I shall inform him of your arrival." She will then head into the private quarters of the castle to locate the Count. She will request your patience if you try to pursue her: "The Count is on his way. Please, remain here and be patient." It may take a few minutes for her to return. After speaking to the Count and being informed of the vampire nest at Bloodcrust Cavern, she will await your return and speak little until your quest is complete: "The Count appreciates your efforts, but as the vampires have not yet been dealt with, he has no interest in seeing you at this time." Once the vampires and their slayers have been dealt with, it will be a different story: "You have completed your tasks for the Count, have you not? Then please, wait here while I inform him." If you ever wish to buy a house in Skingrad, she will point you to another steward: "You'll have to speak with Shum gro-Yarug about that. He's the only one that can handle the deed." After completing the Vampire Cure quest, Hal-Liurz may only say, "Please wait in the hall. The Count will be with you shortly." and break off the conversation when spoken to. This may be fixed in some cases by using the console command stopquest ms40, which ends the vampire cure quest; apparently the game does not always recognize when the quest ends.